Taking care of the environment has become an important topic of discussion for many. As concerns about climate change and environmental sustainability become greater, people often look at how they can make a difference by enacting changes in their own lives. For businesses, going green is becoming a popular trend. Not only do companies help reduce waste in their communities, but green initiatives in the office can drastically reduce expenses and waste that add up on the balance sheet. In fact, several Fortune 500 companies have made the switch to green policies and saved billions of dollars already. How can businesses of all sizes enjoy the many benefits of going green? The main reason for making new policies directed at improving office sustainability is to help reduce the impact that an office can have on the environment. However, going green can also be a competitive advantage for many businesses. Consumers want to support businesses that have similar values to their own. In addition, the cost savings from choosing sustainable solutions can also be a nice boost for any business. Making money is always in style. 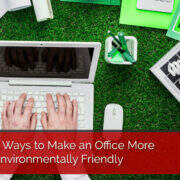 Embracing the office sustainability trend can mean a boost to business and a reduction in unnecessary expenses. Talk about a win/win situation! A busy office can go through toner and ink cartridges quickly. Ink cartridge recycling is a great way to reduce the waste created when a cartridge needs to be replaced. Far too many cartridges simply end up in the garbage bin and, ultimately, are sent to a landfill where they will sit. Worst of all, most plastic takes hundreds of years to degrade and, when it does, it can release harmful chemicals into the environment. Toner cartridge recycling can greatly reduce the amount of office waste that ends up in landfills. Best of all, many cartridges can be re-used or re-purposed so that the plastic is not wasted. This simple change of adopting recycling can make a huge difference for offices that want to go green. At lunch time, the break room is buzzing with activity as employees gather to enjoy their meals and some downtime away from their computer displays. However, for much of the day, the break room likely sits empty and unused. Motion sensor lights or timed lights can help reduce energy usage in the office. Simply shutting off lights when they are not being used could save a large office on their monthly utility bill and be a very effective sustainability solution. Changing light switches to accommodate this initiative is a small expense that can make a huge difference. Using re-usable water bottles is a very effective way to reduce waste. But what about large plastic water jugs at the water cooler? While those are a better solution than individual, single use water bottles, they are not the best solution for an office that wants to take sustainability seriously. The best way to quench everyone’s thirst and keep the environment in mind is to adopt a water filtration system. Some systems even use atmospheric water so there is no additional water consumption shown on the utility bill! When celebrating a birthday or special event in the office, it is tempting to use single use paper plates or plastic cups to simplify clean up. While this may make cleaning up a littler easier, the waste generated by these items is massive. Stocking the break room with reusable plates, utensils, and coffee mugs is a great way to cut down on waste. Another major problem with these single use items is the cost. While one package of plastic cups will not break the bank, a few packages are certainly more expensive than simply buying affordable glassware that can be reused. It is simply impossible for many offices to eliminate printing and paper usage. However, there are several ways to reduce paper usage and still deliver quality service. The obvious solution is to begin printing on both sides of the page, send files or presentations digitally instead of printing, and find other solutions that can take the place of paper. Managed print services can help reduce paper usage as well. A print assessment can help identify areas where workflows can be improved and digital document solutions can be used in place of paper documents. Many businesses incorrectly think that office sustainability is costly or complicated. This does not have to be the case. Something as simple as toner cartridge recycling and ink cartridge recycling can make a huge difference without adding challenges that slow the office down. Want to learn more about green initiatives in the workplace? Contact Smile Business Products today!